Quantifiable Edges: The Most Volatile Market Environment...Ever? In other words, the "theoretical Dow" uses the daily highs for all 30 Dow components to calculate the index high, and the lows to calculate the index low. In January of 1992, Dow Jones started using the "actual" method, which calculates the index at 10-second intervals throughout the day. Before this point, the theoretical calculation was the only way to compute the high and low of the index. This method assumes that all stocks hit their high or low at the same time. Because this rarely happens, the theoretical high will almost always be higher than the actual, and the theoretical low will almost always be lower than the actual. Thanks Rob for including the depression era. I believe the current trading environment will be similar to that past era. 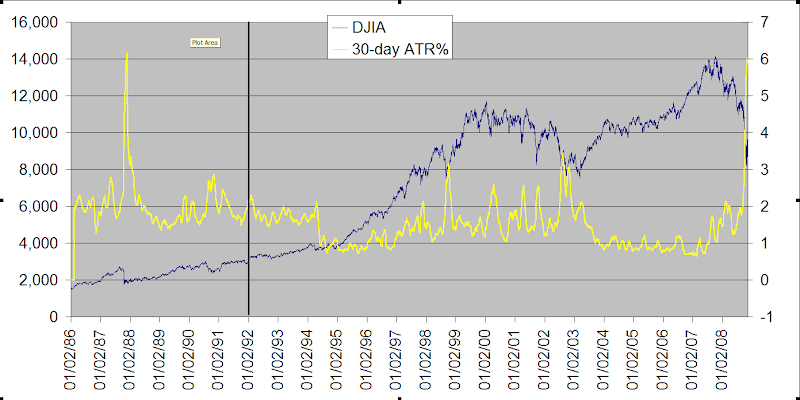 will be interesting and on alert when the ATR% comes back down toward 2.